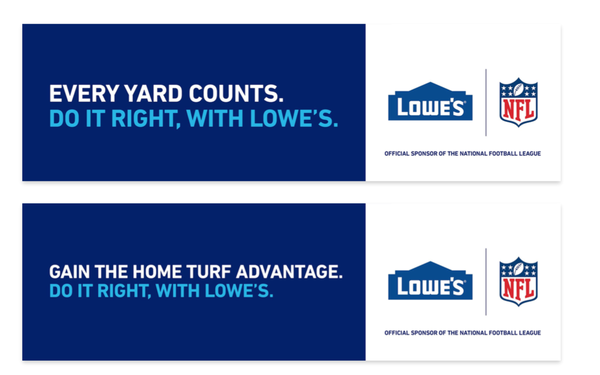 Lowe’s is the latest brand to jump on the NFL sponsorship bandwagon. The retailer announced a multiyear partnership, becoming the League’s Official Home Improvement Retail Sponsor. The exclusive deal grants Lowe’s the ability to market and activate on a national and local level throughout the year, including at key events such as the Super Bowl, NFL Draft, NFL Combine, NFL Kickoff and in support of the NFL Salute to Service. Lowe’s will be the presenting sponsor beginning at Super Bowl LIV in 2020. The sponsorship also will serve as the kickoff of the brand’s “Do It Right” campaign, set to debut in February. Meanwhile, Hyundai Motor America says it will not renew its deal with the NFL, which ran four seasons. No “official auto” replacement has been named, although Ford could be a possibility. Ford announced a three-year deal in 2016 as the official truck sponsor of the NFL. The automaker also has the $50 million naming rights deal for Detroit’s NFL stadium, Ford Field, through 2027. Hyundai CMO Dean Evans says the automaker will continue to work with the NFL as the sponsor of individual teams (six during the 2018 season: the Arizona Cardinals, Houston Texans, Los Angeles Rams, Miami Dolphins, Minnesota Vikings and Pittsburgh Steelers) as well as the presenting sponsor of NBC’s “Sunday Night Football” kickoff show. Most of the money saved by not renewing the sponsorship will be reallocated to media buys, he adds. Earlier this month, Caesars Entertainment Corporation signed on as the NFL’s first-ever official casino sponsor. The multiyear partnership started with the 2019 NFL playoffs, which began on Jan. 5. Seven NFL teams have relationships with Caesars: the Atlanta Falcons, Baltimore Ravens, Chicago Bears, Indianapolis Colts, New Orleans Saints, Oakland Raiders and Philadelphia Eagles. Another new sponsor this season is mattress manufacturer Sleep Number, which signed a multiyear sponsorship deal in January 2018. The company offered every NFL player a 360 smart bed that reacts to body movement and adjusts firmness accordingly. Pizza Hut stepped in as the official NFL pizza sponsor in March when former sponsor Papa John’s severed its ties with the league after founder John Schnatter blamed his company’s poor sales on the NFL’s handling of the player protests. The new pizza sponsor is using the Super Bowl to play up the relationship, formally changing the signage to Pizza Hut-Hut at a restaurant in downtown Atlanta, where the game is being held. Fans outside of Atlanta will see Pizza Hut-Hut branding make its way to the restaurant's website, social channels and game day email communications. Pizza Hut is also getting its team members ready with dedicated "prep rallies" -- internal training sessions that include a personalized hype video from Pizza Hut ambassador and NFL player JuJu Smith-Schuster.